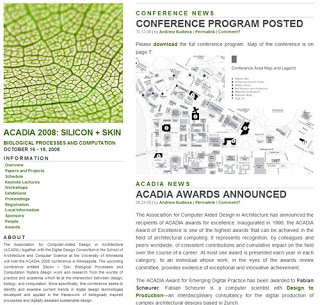 This week in Minneapolis: The Association for Computer-Aided Design in Architecture (ACADIA) together with the Digital Design Consortium in the School of Architecture and Computer Science at the University of Minnesota will hold the ACADIA 2008 conference in Minneapolis. The upcoming conference entitled Silicon + Skin: Biological Processes and Computation fosters design work and research from the worlds of practice and academia which lie at the intersection between design, biology, and computation. More specifically, this conference seeks to identify and examine current trends in digital design technologies developed and applied in the framework of biologically inspired processes and digitally assisted sustainable design.